After graduating from Medical School in Peru, Javier Fuentes-León made a radical change in his life and moved to Los Angeles in 1994 to pursue an M.F.A. in film directing at the California Institute of the Arts. 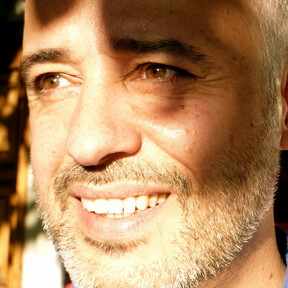 His thesis film, Rooms, won the National Award for Short Films from the Peruvian government in 1997. In 2000, the National Theater of Peru considered his play Mr. Clouds among the best of the year and published it in the compilation Dramaturgia Nacional 2000. In the following years, Fuentes-León worked as the lead writer for two law-enforcement reality TV shows at the Telemundo Network in the U.S., subtitled films for major Hollywood studios, and worked as an editor of commercials and TV shows–including Rachael Ray’s Tasty Travels for the Food Network–while focusing on his own writing and directing projects. His second short Gemini premiered at Outfest 2004 and screened at various international film festivals. The screenplay for his first feature Contracorriente (Undertow) won several prizes around the world in important venues such as the 2004 La Habana Film Festival and the 2005 Berlin International Film Festival. A co-production between Peru, Colombia, France and Germany, Contracorriente had its world premiere at the 2009 San Sebastian Film Festival, where it received the Sebastiane Award for best film with LGBT content and its U.S. premiere in the Sundance Film Festival’s World Cinema Competition, where it won the Audience Award. Since then, Contracorriente has won over 50 awards at film festivals around the world, including Audience Awards at Cartagena, Montreal, Miami, Chicago, Utrecht, Lima and Galway, as well as Jury Awards in Madrid, San Francisco, Seattle, Toulouse and Philadelphia, among many others. Contracorriente was also chosen as Peru’s official submission for the 2011 Academy Awards (Oscars) and received a nomination as Best Latin American Film at the 2011 Goya Awards in Spain. His second feature film, The Vanished Elephant, won the prestigious production grant from the Peruvian Film Commission and had its world premiere at the 2014 Toronto International Film Festival, where it was chosen as one of the top 10 foreign films to watch. A coproduction between Perú, Colombia and Spain, The Vanished Elephant recently had its Latin American premiere as a main gala at the 2015 Cartagena International Film Festival in Colombia. Currently, Fuentes-León is developing his next three film projects: The Woman Who Feared the Sun (based on his play “Mr. Clouds”), a love story with touches of fantasy, which was invited to Film Independent’s 2011 Screenwriting Lab and garnered interest at the 2011 Berlinale Co-production Market, the 2011 Film Independent Fast Track and the 2011 IFP’s No Borders Market; Noblesse Oblige, a comedy of manners about the class divide in Peru, and Sinister, a rock musical set in a restrictive society of the near future, for which Fuentes-León is also writing the music. Fuentes-León is also developing a TV series called Prophet, about an unwilling prophet whose otherworldly gift attracts a power-hungry media tycoon. Fuentes-León sits on the board of directors of Film Independent, the non-profit film organization behind the Film Independent Spirit Awards and the LA Film Festival.